[195 Pages Report] The battery energy storage systems are primarily used to reduce peak demand charges; integrate renewable source, regulate voltage, and frequency; and provide backup power supply. The battery energy storage system market was valued at USD 1.45 Billion in 2017 and is expected to reach USD 8.54 Billion by 2023, at a CAGR of 33.9% between 2018 and 2023. The base year considered for the study is 2017, and the forecast period is between 2018 and 2023. The major factors driving the growth of the battery energy storage system market include the increasing demand for grid-connected solutions, high demand for the lithium-ion technology in the renewable energy industry, and declining prices of lithium-ion batteries. The research methodology used to estimate and forecast the battery energy storage system market begins with obtaining the data on the revenues of key vendors through secondary research via sources such as European Committee for Standardization (CEN), and International Electrotechnical Commission (IEC). The vendors’ offerings have also been taken into consideration to determine market segments. The bottom-up procedure has been employed to arrive at the overall size of the battery energy storage system market from the revenues of key players. After arriving at the overall market size, the total market has been split into several segments and subsegments, which have then been verified through primary research by conducting extensive interviews with the key experts such as CEOs, VPs, directors, and executives. The market breakdown and data triangulation procedures have been employed to complete the overall market engineering process and arrive at the exact statistics for all the segments and subsegments. The breakdown of the profiles of primaries has been depicted in the following figure. Some of the major players operating in the battery energy storage system market are ABB (Switzerland), LG Chem (South Korea), NEC (Japan), Panasonic (Japan), Samsung SDI (South Korea). The battery energy storage systems provided by these players are required to meet the standards mandated by governmental organizations, such as International Organization for Standardization (ISO). 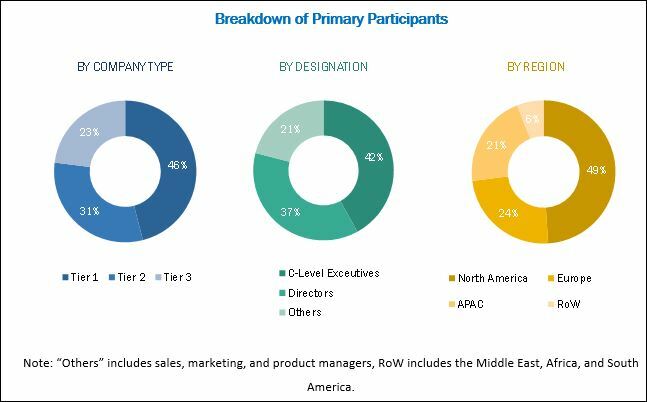 This research report categorizes the battery energy storage system market on the basis of element, battery type, ownership, connection type, application, and geography. The battery energy storage systems market for on-grid connection is expected to grow at a higher CAGR between 2018 and 2023. The on-grid battery energy storage systems use the utility grids for supplying electricity to consumers, which also helps reduce the energy bills. The load leveling, peak shaving, and power demand management are the main applications of any on-grid connected battery energy storage system installed with electrical grids. These factors contribute to the growth of the market for on-grid battery energy storage systems. The market for the customer-owned battery energy storage systems is expected to grow at the highest CAGR between 2018 and 2023. The customer-owned battery energy storage systems help reduce the electricity cost, as electricity is charged under the time-of-use (TOU) tariff. Under the TOU tariff, the customer can easily reduce the energy cost (electricity cost and annual investment cost) through the adoption of battery energy storage systems. Batteries held the largest size of the battery energy storage system market in 2017. Battery is the major part of the battery energy storage systems. It leads to 60% of the total cost of the system. The different types of batteries used in the battery energy storage systems are lithium-ion, advanced lead-acid batteries, sodium–sulfur, and flow batteries, among others. The choice of these batteries depends on the characteristics of these batteries and their intended application. Availability of types of battery is driving the growth of the market for this market. The battery energy storage system market for utilities is expected to grow at the highest CAGR between 2018 and 2023. The generation and consumption of electricity need to be matched at all times, as mismatch leads to the voltage and frequency deviations, and causes power outages and damage to the equipment. To overcome this problem, the utilities install battery energy storage systems with the electric grids, which control the voltage and frequency deviations. The battery energy storage systems used in utilities is a cost-effective alternative to replace a conventional infrastructure, especially in helping substations, and transmission and distribution (T&D) line to meet growing peak demands. These factors are fostering the growth of the battery energy storage system market. The battery energy storage system market in APAC is expected to grow at the highest CAGR between 2018 and 2023. Among the major APAC countries, Japan is contributing immensely to the market. The Japanese government is aiming to make the Japanese companies capable of holding ~50% share of the world’s battery storage market by 2020. Japan has an active policy approach to energy storage, and it develops the battery storage industry policies for the adoption of storage technology. Some of the leading battery manufacturers providing batteries for the battery energy storage system are GS Yuasa, Hitachi, Mitsubishi, NEC, Panasonic, and Toshiba for lithium-ion; GS Yuasa and Shin-Kobe Electric Machinery for lead-acid batteries; NGK Insulators for sodium–sulfur batteries; and Sumitomo Electric for redox flow batteries are driving the battery energy storage system market. 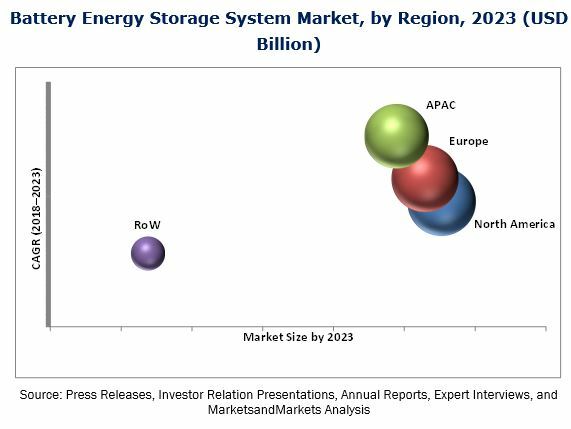 Major factors restraining the growth of the battery energy storage system market include high capital investment required for the deployment and lack of the availability of vendors and project financing. Key market players such as ABB (Switzerland), LG Chem (South Korea), NEC (Japan), Panasonic (Japan), Samsung SDI (South Korea) have adopted strategies such as product launches and developments, expansions, acquisitions, agreements, contracts, collaborations, and partnerships to gain a competitive edge in the battery energy storage system market and expand their distribution networks.